that haven’t even been developed yet. Technology is integrated into all aspects of learning at Darlington School (because our world requires it). Darlington has a responsibility to develop students who are digitally capable, literate, discerning, and responsible. We believe that the best way to accomplish this goal is to create a technologically-infused environment in the classroom and throughout all learning environments. All students learn to connect. All Darlington students have an individual iPad or MacBook Air. This not only connects our students to online academic resources, but prepares them for a technologically connected world while allowing them to research and work independently. While all students are given a higher level of technology literacy, more specialized technology classes are also an essential part of our curriculum. 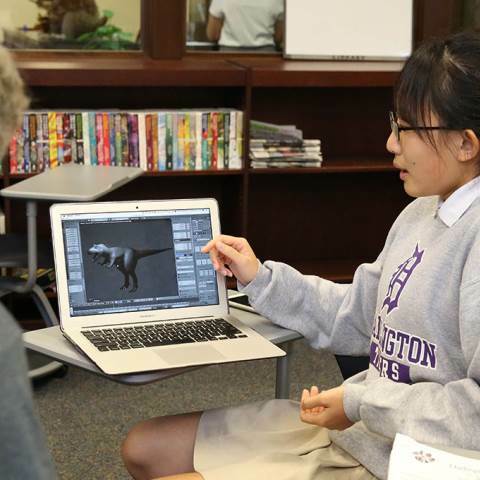 Our middle grades students have the opportunity to be a part of the Creative Technologies class while our Upper School students get to choose from Robotics, Design Thinking, and Computer Science classes. Discovering and exploring with STEM. Technology integration at Darlington has also expanded to classroom STEM activities (Science, Technology, Engineering and Math), and student makerspaces and dedicated faculty are available for students in both Pre-K to 8 and Upper School divisions.